Now that SXSW has come to a close, our pals at Showtime Network shared a list of the top trending topics, presentations, bars and restaurants from throughout the festival (as determined by aggregated social media data). To say that it took over Austin is an understatement, especially with the national focus on the city with Jimmy Kimmel Live’s stint here all week. The Showtime Network folks analyzed data from throughout the Interactive, Film and Music Festivals to identify the top spots that festival-goers – local and visiting – flooded and favored. For background, as the official SXSW Go sponsor, Showtime Networks added a trending functionality to the SXSW app to promote the new Showtime Networks series Penny Dreadful. Each day, SXSW GO app users were able to access trending data through tarot card readings (a theme from Penny Dreadful) provided by Showtime via banners in the app, which suggested trending bars, restaurants and popular sessions around SXSW. How cool is that? #BoldStage, #BoldBravery & #iAmARTPOP – By far the biggest trending topic throughout SX was Doritos’ campaign, launched at SXSW around the #BoldStage Concert Series. Doritos and the Series’ headliner, Lady Gaga’s fans competed via the #BoldBravey hashtag by posting videos of the “best bold actions to stand out as an individual” for a chance to win tickets to see Lady Gaga on Thursday 3/10. The performance dominated social chatter that night and Gaga continued the hype the following day with her presentation, discussing her most recent album, ARTPOP. #Snowden, #SXSnowden & #NSA – Fugitive & NSA leaker Edward Snowden’s speech via a livestream from Russia garnered a ton of social attention, both positive and negative. Social media closely followed the presentation as Snowden explained why Congress and the NSA need a watchdog; conversation stayed strong for days after. #iTunesFestival – Day after day, the #iTunesFestival was among the top topics discussed on the ground in Austin. The 5-night festival included performances from Coldplay, Imagine Dragons and Kendrick Lamar as well as Soundgarden and Pitbull. #Parallel & #PreOrderParallel – Parallel, the new single from Heffron Drive, gained surprisingly strong social media attention at SXSW before, during and after the band’s show on Saturday, March 15th at Creekside at Hilton Garden Inn. In addition to the show, fans were most discussing pre-order sales of the much-anticipated album. #neighborsmovie & #teamze – Kicking off the film festival, the screening of “Neighbors” – a comedy starring Seth Rogen, Lisa Kudrow, Rose Byrne and Zac Efron - was the top-trending movie of the festival. Critics and fans praised the new film, noting many similarities to “Knocked Up,” which also stars Seth Rogan and premiered at SXSW in 2007. Stubb's Bar-B-Q – Stubb’s Bar-B-Q hosted loads of networking events, parties and shows, most dramatically spiking in check-ins Monday and Tuesday. Among the most popular events were SPIN Magazine’s Day Party on Friday 3/14, Connect Networking Event on Monday, 3/10 and the MediaTemple Interactive Closing Party (celebrating 30 years of Def Jam with 2chainz, Pusha T, Method Man & Redman and Aloe Blacc) on Tuesday, 3/11. 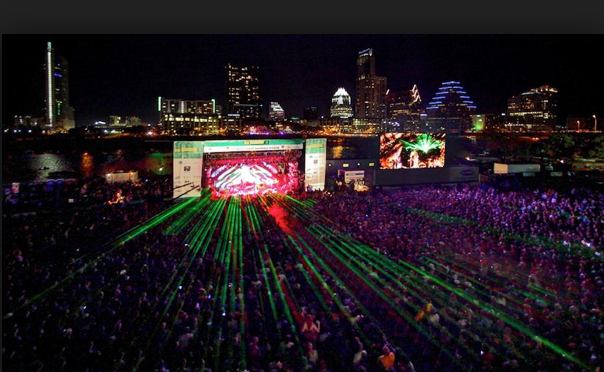 Located at 801 Red River St.
SXSW Spotify House – The Spotify House at SXSW consistently rocked as one of the top trending places to catch music at the festival. The House hosted performances by 30+ acts including the Dum Dum Girls (with a special surprise appearance from Blondie’s Deborah Harry), Phantogram, Warpaint and rappers G-Easy and Chuck Inglish. The CW Network also sent celebs to drop by to join the party March 10-14. Located at 901 E Sixth Street. The Driskill Bar – The historic hotel’s bar trended consistently throughout the festival thanks to its iconic presence downtown and nightly performances from artists including singer songwriter Robert Allan Caldwell, country trio Silas Lowe and honky-techno band Starlings, TN. Located at 604 Brazos St.
Maggie Mae’s – As an official SXSW venue, Maggie Mae’s held its own in the trending lists for check-ins. The venue kicked off SXSW events on Sunday 3/11 with a digital marketing networking party, Latitudes: A Global Mixer, and gained even more check-ins later in the week with performances from Hey Chica! Alex Anwandter and Astro and their Austin Jump-Off Party. Located at 323 E 6th St.
Cedar Street Courtyard – The bar and venue joined the trending lists late in the festival, spiking in check-ins on Tuesday with a show from Deer Tick, the exclusive headliner for the invite-only event - #DynMMT – put on by Dyn, an Internet performance solutions company. Cedar Street Courtyard also hosted shows from The Hold Steady, Madi Diaz, Trixie Whitley, Rhett Miller and Salim Nourallah. Located at 208 W. 4th St.